The SRP Environmental Industrial Hygiene Division is lead by a Certified Industrial Hygienist (CIH) with over 25 years of experience. SRP Environmental will evaluate each client’s potential exposure to determine if Exposure Monitoring is necessary and if so, what type of sampling is required to meet the requirements of OSHA’s 1910.1000 standard. SRP utilizes Analytical Laboratories accredited by the American Industrial Hygiene Association. – Hexavalent chromium (Cr(VI)) is a toxic form of the element chromium. Hexavalent chromium is rarely found in nature and is generally man-made. Cr(VI) is widely used in pigments, metal finishing (electroplating), wood preservatives and fungicides, and in chemical synthesis as an ingredient and catalyst. Hexavalent chromium may also be present in fumes generated during the production or welding of chrome alloys. Workers can inhale airborne Cr(VI) as a dust, fume or mist while, among other things, producing chromate pigments, dyes and powders (such as chromic acid and chromium catalysts); working near chrome electroplating; performing hot work and welding on stainless steel, high chrome alloys and chrome-coated metal; and applying and removing chromate-containing paints and other surface coatings. Skin exposure can occur while handling solutions, coatings and cements containing Cr (VI). Hexavalent Chromium exposures are regulated by the OSHA Hexavalent Chromium Standards: general industry (29 CFR 1910.1026), shipyards (29 CFR 1915.1026), and construction (29 CFR 1926.1126). Exposure monitoring is conducted following the OSHA ID215 method. Welding surveys – Welding processes generate multiple airborne exposures that may be toxic to employees. 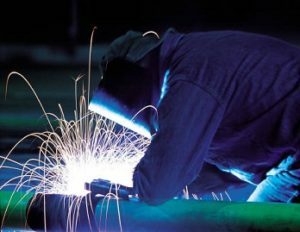 Toxic exposures may result from the metals being welded as well as gases emitted from the welding process. Dust/Gas/Vapor exposure monitoring – The SRP Industrial Hygiene group will follow National Institute for Occupational Safety and Health (NIOSH) or Occupational Safety and Health Administration (OSHA) Sampling and Analytical Methods for any chemical that has an OSHA Permissible Exposure Limit, NIOSH Recommended Exposure Limit or American Conference of Governmental Industrial Hygienists Threshold Limit Value. We will utilize state-of-the art sampling equipment, whether a sampling pump or direct reading instrument to obtain the most accurate data possible. Metal Working Fluids – Millions of workers engaged in manufacturing parts for products such as automobiles, farm equipment, aircraft, heavy machinery, and other hardware are exposed to metalworking fluids (MWFs). Metalworking fluids are in widespread, high volume use for their coolant, lubricant, and corrosion resistant properties during machining operations. These fluids are complex mixtures of oils, detergents, surfactants, biocides, lubricants, anti-corrosive agents, and other potentially toxic ingredients. Currently two OSHA air contaminant permissible exposure limits apply to MWFs. They are 5 mg/m3 for an 8-hour time weighted average (TWA) for mineral oil mist, and 15 mg/m3 (8-hour TWA) for Particulates Not Otherwise Classified (PNOC) [applicable to all other metalworking fluids], 29 CFR 1910.1000. Our IH Group can evaluate your workplace setting to characterize the employees’ exposures to these contaminants as well as evaluate other chemicals with fewer hazardous properties while maintaining the necessary lubricating properties. Radon – Radon is estimated to cause many thousands of deaths each year. That’s because when you breathe air containing radon, you can get lung cancer. In fact, the Surgeon General has warned that radon is the second leading cause of lung cancer in the United States today. Only smoking causes more lung cancer deaths. SRP Environmental can measure for airborne Radon to determine the levels inside your home or office. Hydrogen Sulfide (H2S) – Hydrogen sulfide is a colorless, flammable, extremely hazardous gas with a “rottenegg” smell. It occurs naturally in crude petroleum, natural gas,and hot springs. Hydrogen sulfide is both an irritant and a chemical asphyxiant with effects on both oxygen utilization and the central nervous system. Its health effects can vary depending on the level and duration of exposure. SRP Environmental can assist your company in evaluating H2S exposures at your company. Based on this evaluation, we can develop an Exposure Control Program, including Engineering Controls, Work Practices and Personal Protective Equipment. Hospital Exposures – These exposures include formaldehyde (formalin), waste anesthesia gas, nitrous oxide, and xylene. Common places for employee exposure are operating rooms, labor and delivery rooms, and laboratories.